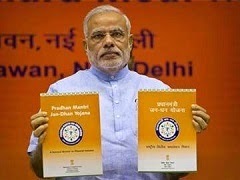 Prime Minister Mr. Narendra Modi on Thursday launched ambitious financial inclusion scheme Pradhan Mantri Jan-Dhan Yojna (PMJDY), under which at least one bank account will be opened per Indian household. Under the scheme, account holders would get a RuPay debit card launched by the National Payments Corporation of India (NPCI) and a personal accident cover of up to Rs 100,000. All those who open account by January 26, 2015, will also get life insurance cover of Rs 30,000. Cardholders would also get an overdraft facility of up to Rs 5,000. NPCI has signed a three-year agreement with private general insurer HDFC Ergo to provide personal accident cover to RuPay cardholders; while similar agreement would be signed with country's largest insurer the Life Insurance Corporation (LIC) of India to offer a life cover. LIC will provide unconditional cover; while HDFC Ergo will provide cover to the cardholders in case of death or permanent disability. As per the agreement between HDFC Ergo and NPCI, a claim will be disposed only if the card is active. A card will be considered active if the cardholder has swiped it within 45 days of making a claim. However, the NPCI is in talks with HDFC Ergo to improvise the scheme so that the claim can be made if the card was swiped within the preceding 90 days. PMJDY also aims at curbing corruption as it would facilitate routing of subsidies directly into the accounts of intended beneficiaries, Mr. Modi said.